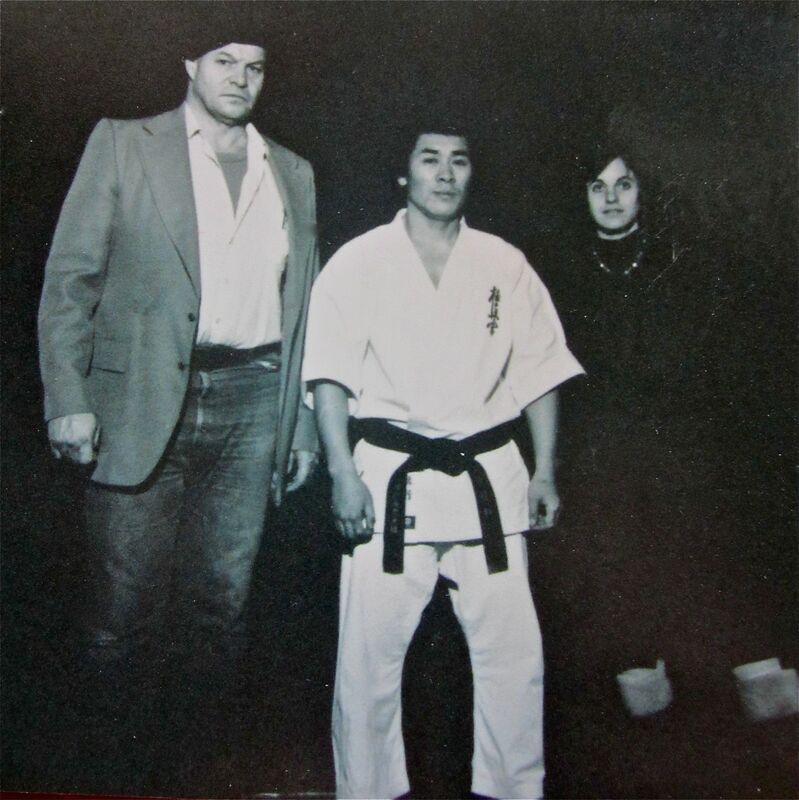 J and me with our Sensei Kishi, long ago in a galaxy far away. I certainly thought both of the other two were, at the time! I was seriously contemplating polyandry. What are you wearing on your legs/feet in that picture?? Well, by that point, life was definitely happening. Answering my question of a couple of years before. Mockturtle, leather boots with a lambswool-type lining that turned out into cuffs. Must’ve been winter. I know I saw those same boots when I was moving; can’t remember whether I gave them away or packed them. They may be here somewhere. Now that it’s going to snow, I hope so. Isn’t it funny how we can be attracted to such different men? Testosterone rules, i guess;0). I’m all for pheromones!! Spelled 1st w/an ~e~, then an ~a~, who knew the ~o~ was the one? You may be right about the beret. Wet; nothing stuck except to cars. CT really got clobbered, I hear. Any word from karen and other denizens of the Great White North? Everyone dug out yet? I think they may still be digging. Hallowe’en was canceled in much of Connecticut, did you hear that? Too many power lines down. Halloween was postponed here in the Boston ‘burbs, too. Trees and utility lines down everywhere. It’s much worse than Irene, at least in places not upcountry. They got theirs in spades from that hurricane. Our power was out for a over a day. It’s usually very reliable. We’ve never had it out that long on our street in 21 years. Nearby friends lost power Saturday PM and still don’t have it back. A tree also fell on our garage, but it didn’t do much damage. Autumn has been extremely late this year. Many, if not most trees still had green foliage. Dump a foot or two of heavy, wet snow on that, and watch it all come crashing down. I suspect this kind of thing is worse for us suburbanites with our leafy trees than Karen and her farm in more open country. But it would be good to hear from her. You all are too kind- so good to think of me!!! You’ll be surprised to know that my little corner of the Kingdom(the NEK)got very little snow– just a dusting here. We are very lucky to have great weather here this week because we had to get our wood in– it’s all split and it was in a huge pile waiting for our ambition to pull our strong (ok, sore but able)backs to the job of hauling it to the cellar and chucking it down and then– stacking it. About 10cord, give or take a few pieces:0). All tucked in for the winter, now. Did i tell you that my cousin lost his house, his whole freaking house– and his pickup- due to Irene? He lives in Jamaica, VT- way South. We don’t keep in touch, so i have to put it in my brain to find out how they are doing. I’m thankful his Dad is a great carpenter. Say, Annie, some day could you tell the story of how you and Jacques got involved in karate? By my reckoning you’re among the second generation of karatekas in the U. S. or thereabouts. I know that I’m among the second generation of judokas. My sensei was a Nisei who grew up in Hawaii and came to the mainland to study dentistry. He, like most of the other early U. S. judokas, started practicing just after WWII.